The scene of my greatest book abandonment. 525 pages read, only 566 to go. It felt like a failure if I couldn’t get through to the end. I also felt an obligation to the author. After all, if I had written a book, I’d want everyone to finish the whole thing, right? I’m not sure when, but several years ago, this guilt went away. I read a great deal, but I probably drop almost as many books as I finish. There are a few reasons why I quit reading a book. The book loses my interest. This is most common with novels. Last month, with great sorrow, I returned to the library a novel I really, really wanted to like. A new novel by one of my favorite writers, I had even tried to pitch a review of it to couple of publications. Now, I’m glad that neither of those pitches worked out. I gave the novel a good shot, but 100 pages in, I still didn’t care one bit for the characters or their problems. Sometimes, a book loses my interest so thoroughly that I actually forget I was reading it, set it down somewhere, and simply never pick it up again. This happened with a novel I had taken to Urbana 12 with me. A few weeks after I returned home, I looked in the backpack I had taken with me and discovered the book. Strangely enough, I had found the book enjoyable enough while I was reading it, but if it had left so little impact on my brain, I didn’t see much point in picking it up again. I realize the book isn’t worth my time. I mentioned this thought to my wife once, and she felt it was a terribly unfair thing to say. But it’s true! There are far more books worth reading than I will ever have time to read, so why should I waste my time on books that are poorly written, poorly conceived, or flat out wrong? Of course, I do waste my time on plenty of books exactly like that. Some of them just strike me as more of a waste than others. The flip side of this is that I get so excited about another book that it overwhelms any desire to finish the book I’m currently reading. Since I’m generally reading several books at the same time, I usually don’t realize that I’m abandoning the book. It’s more like it gets bumped from the rotation. A week or two or three goes by, the book gets returned to the shelf, and it’s quietly dropped. It’s not the book — it’s me. The book isn’t always at fault. Sometimes, I’m not ready for the book. It might be over my head, and I need to do some preliminary reading to work up to the book’s level. 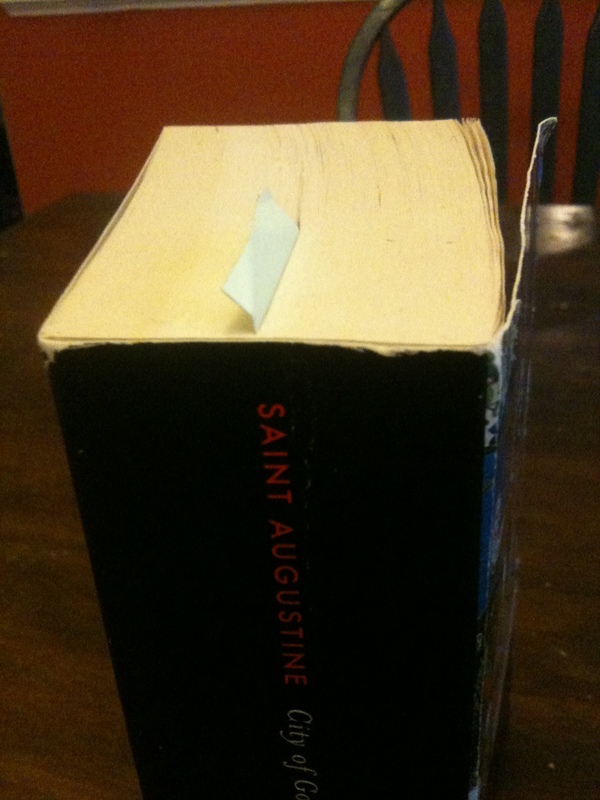 Occasionally, a book goes to an emotional place that I’m not willing to follow, as with my greatest abandonment to date, Augustine’s City of God. Over 500 pages in (which was still only about halfway through), I had to put the book aside. At the time, I was struggling with mild depression, and Augustine began a long, unvarnished meditation on death that I simply couldn’t handle. So I set the book aside, hoping to return to it one day. What are your thoughts? Do you try to finish every book you start? What Books Should Young Christian Scholars Read? One of my favorite things about conferences is learning about new books — or, even better, old books that I somehow hadn’t known about. Most of the attendees at Urbana are undergraduates, so the conference is a great opportunity to send them away with a fresh reading list for the new year. What books about the life of the mind, the academy, and spiritual formation should we recommend? Visit the Emerging Scholars Blog to see the list of books we recommended at Urbana 09, as well as the great suggestions we’ve received from the ESN community. Are There Any Books You Revere? My newest post from the Emerging Scholars Blog. Is it possible to love a book like we love another person? I’ve started my monthly tally of books I’ve read in 2010.Â Two down so far, and another on the way! The second in a planned three-book series, Smith follows the teens he surveyed in Soul Searching into their early adult years (ages 18 to 23). Smith looks at how their religious lives change, as well as the factors (parents, friends, church) that affect their religious attitudes and beliefs. A must-read for anyone working this age group. Iâ€™ve been reading Augustineâ€™s 1,000 page masterpiece a few pages at a time for something like a year now, and it continues to reward. Written in response to the fall of Rome, Augustine takes on accusations that Christianity weakened the Roman Empire, then goes on to describe the â€œtwo citiesâ€ that coexist in history: the city of man and the City of God. Iâ€™m up to Book 13 (out of 22). What does the resurrection of Jesus tell us about our ultimate destiny? What does the resurrection tell us about our life in the present? Wright combines world-class scholarships with a pastorâ€™s tone. One of my new favorite authors. Carter, a leading legal scholar who teaches at Yale, started a new career as a novelist several years ago, with a specialty in complex mysteries set among upper-middle class African American families involved in higher education and politics. Recommended by sportswriter Bill Simmons as the best sports book ever written,it did not disappoint. David Halberstam follows a year in the life of the Portland Trailblazers, illuminating both the individuals who play, coach, and manage basketball and the larger forces of race, money, and fame that shape their lives.